With a new zest for the fight, she charged into the cavern, her battle cry piercing the darkness. Now the creatures were falling left and right, but she noticed that the blue lights weren’t filling up quite as fast as before. When she came to a fork in the tunnels, a light appeared inches from her face and she nearly stumbled back, not expecting that. “Danger,” a voice in her head said as the light flashed with the same word. She realized there was a layer of something in front of her—no, not in front of her, but surrounding her face. She lifted her hand to try and touch her face, and realized her hands were gloved now too, but still allowed for feeling through some sort of sensors. Around her head was a helmet, though she wasn’t sure if she had gotten it when she leveled up or if it had been there the whole time. “This is too weird,” she said, and then stared as the word danger on her display disappeared. Unable to recognize command appeared in its place. It was a HUD. But how did the helmet allow for full visibility—cameras around the sides or something? She was pretty sure the whole thing couldn’t be made of glass, but she had to know. Pausing to take it off, she ignored the words that popped up saying, Danger, do not remove helmet in combat. She found a switch near the back, twisted, and off it came. Sure enough, it was a metallic helmet with a black faceguard, opaque at this angle. She was about to put it back on and continue when a screeching sound came from one of the passageways. A moment later, a burst of red light rushed at her. Throwing herself backward, the light hit the wall behind her and sent pieces of red rock flying in all directions. One hit her in the back, sending her staggering forward and causing her to drop the helmet. Again the sound came and a flash of red. She leaped up, but only had time to brace herself, arms up to shield her face. The action caused a circle of blue light to form an inch from her left arm, and when the red light hit, it sparked, then vanished. Without pausing to think about how she had made the small force field, she grabbed the helmet and put it on as she stood and charged down the tunnel. The danger warning was flashing, but she didn’t care. Something had just shot at her! The next laser came at her and she swatted it aside with her sword, causing the green light of the sword to increase—Hell yeah! More experience points toward the sword upgrade she realized, as she spotted the creature holding a gun and screaming at the sight of her. Instead of continuing to run straight, she pushed off of one side of the tunnel, then hit the other and pushed again, coming at him from an angle he hadn’t expected. Her sword sliced through the weapon first, then the creature. When he lay dead, she looked down at what appeared to be a short, purple-skinned man wrapped in various cloths of black and purple. This simulation was a little too real. Her skin goose-prickled under her armor, and she could sense the change of wind in the tunnel through her sensors. “Turn sensors off,” she said on a whim, and was glad to see that the HUD display responded that it would do so. A moment later, the feeling of wind stopped. Now she could hear her breathing in the helmet, and it felt much more like she was in battle armor. Another message flashed across her screen. Unspent skill points. She frowned, then laughed. That was a message she was all too used to from her video game days. She saw several options flash before her on the HUD, along with the number two. An image of herself appeared, looking quite badass, she had to admit. She was in full combat armor, the sleek metal conforming to her figure without being constraining. “Yes,” she replied. She watched as the word Speed appeared over the figure and a line of yellow increased from zero to one beside it. Next to the word Shield, a blue line extended from zero to one. This was too cool, in her nerdy she-never-would-have-told-her-friends kinda way. The HUD display vanished, leaving only the image of the tunnel that had been partially obscured a moment before. FROM JUSTIN: So yeah, clearly has some of that gamelit stuff in there. And this is just when she’s learning about it – everything gets crazier as we go. 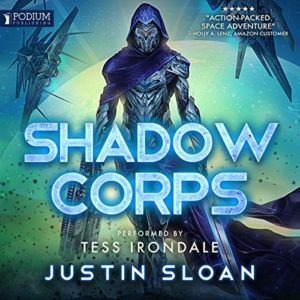 If you’d like to check out the book, it’s on Amazon and KU, and the audiobook was narrated by Tess Irondale. Want more SciFi Gamelit? We have a Facebook Group for that!